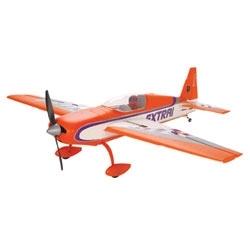 Designed by Mike McConville, the ParkZone® Extra 300 BNF comes out of the box equipped with a powerful brushless motor and Li-Po battery combination that provides more than enough power for precision aerobatics. Positive and negative G maneuvers, snap rolls and more are all within the Extra's capabilities. And it lets you do it all with virtually no roll or pitch coupling. Best of all, you can have it flying in as little time as it takes to charge its battery and bind it to your full range Spektrum or JR DSM aircraft transmitter. Charge-and-Fly™ convenience, outstanding flight performance and beautiful scale detail—with the ParkZone Extra 300 BNF, you get it all. Loose Wheel Pants; See Addendum under the Support Tab.